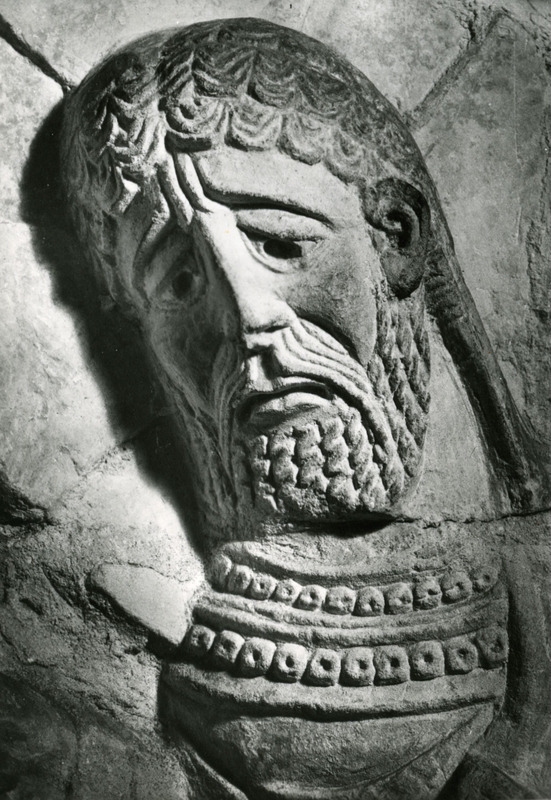 “The Cathedral, Chichester, Sussex, England - Head of Christ,” Gothic Past, accessed April 23, 2019, http://gothicpast.com/items/show/3950. This frontal view of the Head of Chirst is a detail fromthe Raising of Lazarus, one of two renowned panels in the south aisle of the choir. They are either Anglo-Saxon c.1000 or Norman c.1130. It is believed that possibly the deeply hollowed eyes were once inlaid with precious stones. In any event, they serve here, as in other figures of the panel, to convey a reverent feeling of wonder and compassion at the awesome moment of the miraculous resurrection.